Manchester United suffered their first loss in the Premier League under Ole Gunnar Solskjaer at the Emirates Stadium. 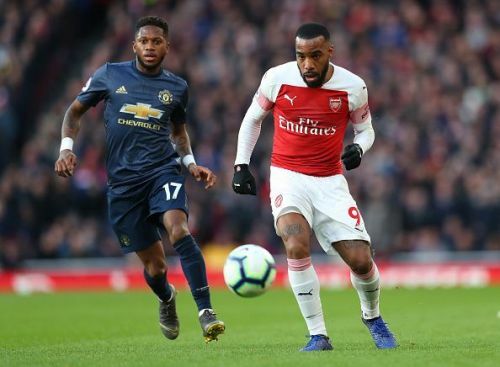 The Red Devils came into the game after their historic win in Paris while Arsenal was beaten by Stade Rennais 3-1 in the Europa League round of 16. They were favorites to win the game and cement their credential for the Champions League spot but missed chances and hard luck lost them the game. Ole Gunnar Solksjaer's men started the game on the front foot with Romelu Lukaku hitting the post from Luke Shaw's peach of a delivery from the left flank. However, Arsenal took the lead from Xhaka's strike from outside the box which left De Gea bamboozled as the ball swerved opposite to where the goalkeeper expected it to go. United created some slick moves after that and came close again when Fred hit the post from a strike outside the box. The Red Devils looked the side to score the next goal at the end of the first half and started the second half with the same intensity. Unfortunately, they were hit hard when Arsenal won a controversial penalty which looked like a soft contact on Lacazette by Fred and the Frenchman made the most of it. Aubameyang took the responsibility again after his horrific miss against Tottenham Hotspur last week but made no mistake this time around. The game ended 2-0 in favor of the home side. 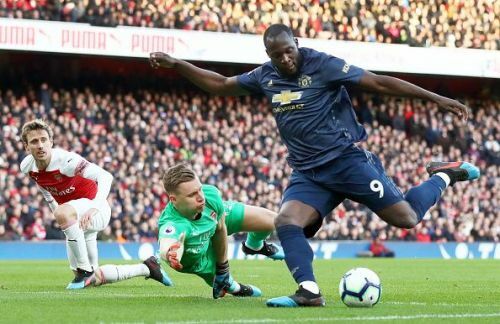 Romelu Lukaku was on a brilliant goal-scoring form coming into the game and was expected to continue it against Arsenal. He had some brilliant chances yesterday and could have scored a hattrick but poor finishing and some bad luck prevented him from doing so. The hit the post from inside the 6-yard box from a brilliant whipped cross by Luke Shaw. He was denied another opportunity when he took the ball past the goalkeeper just like he did in Paris against Gigi Buffon but Leno was more than equal to it and stopped it from going in. He was again presented with a gilt-edged opportunity when he was left one-on-one with the goalkeeper from a brilliant pass by Marcus Rashford which he also failed to convert. Romelu Lukaku could have won the game single-handedly but was unable to do so. Manchester United made history with their victory over Paris Saint-Germain on Wednesday and had to work really hard for the victory. 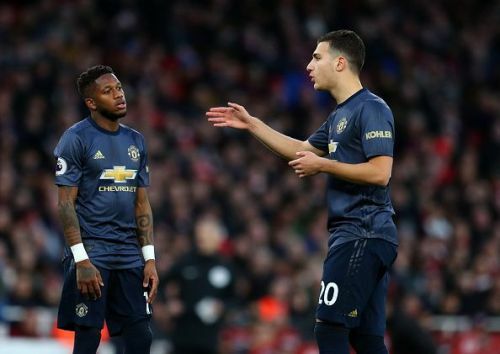 Fred and Mctominay covered the most distance in that game while Romelu Lukaku and Marcus Rashford were also running up and down the field for Manchester United. Most of the players that played 90 minutes against PSG started again against Arsenal. “We started slow, maybe a backlash from Wednesday night,” said Ole in his Post Match interview. Marcus Rashford especially looked out of his depth in yesterday's game. Manchester United players protesting against the penalty decision. 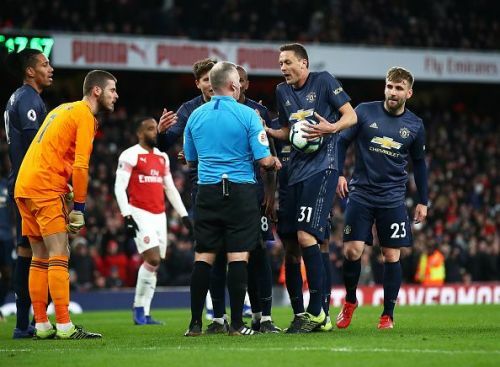 Manchester United was handed a controversial penalty in midweek against Paris which won them the game and then conceded a controversial one against Arsenal in yesterday's game. That's football, isn't it? But it looked like a wrong decision by Jonathan Moss as the contact looked soft and Alexandre Lacazette made the most out of it. The penalty also came against the run of play for Arsenal. Manchester United was creating opportunities and looked destined to score. But the penalty changed the momentum against them and killed the game. The decision cost United a point, or maybe 3.